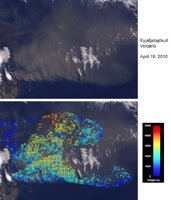 NASA's Terra satellite flew directly over Iceland on April 19, 2010, allowing the Multi-angle Imaging SpectroRadiometer (MISR) instrument to capture a series of images of the Eyjafjallajökull volcano and its erupting ash plume. Figure 1 is a view from MISR's nadir (vertical-viewing) camera, and covers an area measuring 412.5 by 279 kilometers (256.3 by 173.4 miles). The companion image, Figure 2, is a stereo anaglyph (see also PIA13051) generated from the nadir and 46-degree forward-viewing cameras. The plume height can be estimated by viewing the anaglyph with red/blue 3-D glasses (place the red filter over your left eye). In these images, north is at the left, and east at the top. In addition to the main plume, there are some smaller streamers visible to the east (above) it. They are at lower altitude than the main plume. Due to the presence of wind, which causes the plume features to move between successive camera views, the anaglyph gives the erroneous impression that they are below the land surface. A quantitative computer analysis is necessary to separate out wind and height. This is shown in Figure 3, which contains a portion of the nadir image in the top panel, covering an area of 189.5 by 136 kilometers (177.7 by 84.5 miles). The lower panel of Figure 3 contains a map of heights, corrected for the effects of wind, along with a color scale. The smaller streamers are just several hundred meters above the surface, whereas the main plume extends to an altitude of about 4.5 kilometers (2.8 miles). 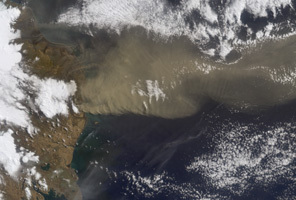 This is smaller than the 7.3 kilometer (4.5 mile) altitude measured by MISR on April 14, 2010, though conditions remain highly dynamic.